I love Valentine's Day. It's a perfect opportunity to take the time to tell someone you care, whether that person is your other half, a family member or a friend. I like the chance to think of original and personal gifts, but sometimes the uniform flowers, chocolates and perfumes do the job just as well if a little thought has gone into it. The Emma Bridgewater baking dish would make an excellent gift for any keen baker. What could be better than a heart shaped pudding?! Chanel perfumes are a little bit special. I love how the bottle looks on my bedside table. I like to pretend I'm a glamourous French lady as I spritz on Coco Mademoiselle, so for me, this would be the perfect gift. The heart shaped lolly from Thornton's is a cute little token as chocolate always goes down well. This would be the perfect little treat for colleagues. Tulips are my favourite flowers and I'd definitely rather receive a pretty bunch of them rather than roses. When I saw these tulip bubble wands from Lush, my heart skipped a beat! They smell of chocolate and oranges, which is a scent I can take or leave, but I know lots of people go mad for it! You can also plant the paper tag, as it has seeds in, and watch some pretty flowers grow! I've got a thing about arrows at the moment and love this simple necklace from Topshop. It would look really cute with T-shirt dress for a casual outfit. I really want to try out Topshop's Lip Crayons. They look so easy to apply when you're on the go. Secret Party is a gorgeous bright raspberry shade which is perfectly flirty for Valentine's Day. Lastly, and possibly my favourite, is this tote bag from Paperchase. The slogan is really sweet and perfect for any typography geeks! Will you be celebrating Valentine's Day this year? So many lovely things. I really like that necklace, valentines gift for myself? 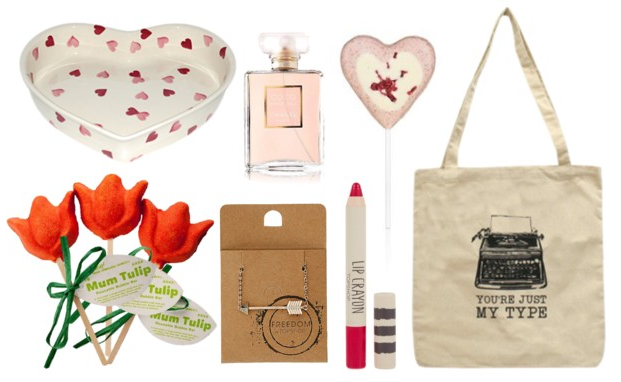 Such a cute wishlist! Love the tote bag - so cute! The lipstick looks a really lovely colour too.